Pedro Gomez (born August 20, 1962 in Florida) is a Phoenix-based reporter for ESPN's SportsCenter show. He is primarily a baseball reporter and is also a member of the Baseball Writers' Association of America. He has covered 15 World Series, and more than 10 All-Star Games and is a voting member for the Baseball Hall of Fame. Gomez is the son of Cuban refugees, born just 20 days after his parents arrived in 1962 via PAN AMERICAN, two months before the missile crisis of October 1962. Gomez attended Coral Park High School in Miami, as well as Miami-Dade Community College (south campus) and the University of Miami. After years of covering high schools and general assignment sports in Miami, San Diego and the San Francisco Bay Area, Gomez became a full-time baseball beat writer in 1992, covering the Oakland Athletics for the San Jose Mercury News and Sacramento Bee from 1990 to 1997. During his tenure as a writer covering the Athletics, Gomez, a lifetime baseball fan, covered major stories such as the Cincinnati Reds victory over the defending World Series champion A's in 1990, José Canseco's trade to the Texas Rangers for Rubén Sierra in 1992, Rickey Henderson's 1,000th stolen base, and other moments of relative importance to the team. He gained much experience during this seven-year period as a writer for those newspapers. His work in Sacramento, San Jose and later as a national baseball writer and general sports columnist for the Arizona Republic in Phoenix from 1997 to 2003 led to ESPN's hiring of him in 2003 to work at SportsCenter. 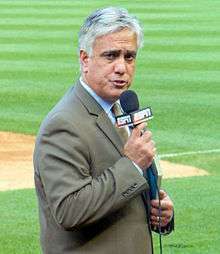 Gomez specializes in baseball reporting for ESPN and followed Barry Bonds for the better part of three seasons as Bonds pursued Hank Aaron for the all-time home run record. ↑ Yoder, Matt (4 September 2014). "Real Tweets from Real People – Pedro Gomez's play by play debut". Awful Announcing.